This machine cannot be accused of being lightweight or 'underbuilt'; if it wasn't for the livery it could be mistaken for a trade model. Indeed it is a fact within the power tool industry that some tools do transfer or are rebadged between ranges although this may not be the case here. The tough plastic body has rubber overmould panels but even the bare plastic has a slightly grippy feel to it. It has a switch with a lock best operated by a right-hander. There is a variable speed dial on top and an orbit lever on one side but strangely no blower switch. However, it does have a detachable extraction port that looks big enough to actually work. An Allen key can be used to alter the base angle for bevel cutting; however, it isn't possible to do flush cuts as the blade is set too far back although you do get a switchable worklight in front of it. A clear flip-up plastic shield sits ahead of a wire guard that protects fingers from the blade. Blade changing is the now fairly universal quick change lever pattern. Blades need to be pushed home firmly so use a protective glove. It also has very efficient sprung loaded blade ejection! Lastly, the soleplate is smooth pressed steel mounted in an aluminium base which takes a fence. At 800W this machine isn't underpowered and it comes supplied with a long rip blade so it can, in theory, cope with most work although the blade wasn't good quality and struggled. I tried another well known brand and it was different story - so don't buy cheap blades! A blower would be handy as extraction can be a drag, quite literally, with a hose attached. 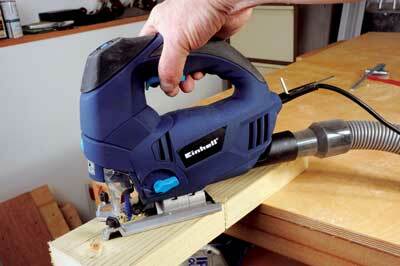 It does pretty much whatever you want of it and the worklight helps you do it. There is a small QR code panel on the body side but it doesn't react to scanning with a camera phone so it may be intended for use by service departments only. 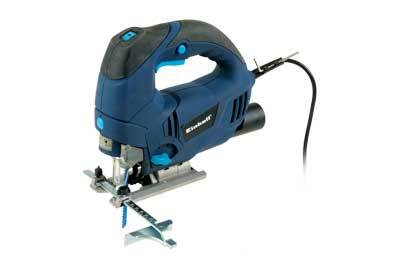 A good piece of kit if you need a better quality jigsaw.